This month's challenge is brought to us by Karen of Bake My Day and Zorra of 1x umruehren bitte aka Kochtopf. They have chosen Tuiles from The Chocolate Book by Angélique Schmeink and Nougatine and Chocolate Tuiles from Michel Roux. We were also challenged to pair our tuiles with a light, fruity treat. Because our lemon tree is overflowing with Meyer lemons, I decided to go for a lemon pudding from Luscious Lemon Desserts which is a cute little lemon cookbook that I got a while back but have never really used much. 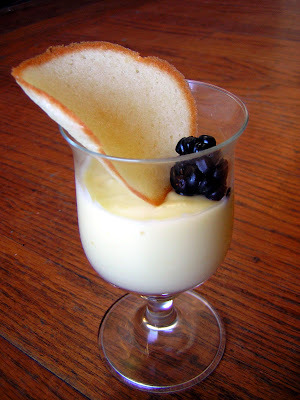 Made with Meyer lemons, the pudding was mild yet distinctively lemon flavored and not too sour. It was really creamy and delicious, with a fairly soft set compared to commercial puddings. Although I would say the pudding is best served chilled, make sure to taste it warm as that's definitely a treat as well! I'm glad to have finally tried out this cookbook and I'll definitely be trying some more recipes from it while our tree has so many lemons. As for the tuiles, the flavor was nice but overall the cookies felt like more of a garnish. I had a hard time getting the cookies thin enough and they were definitely a little too thick and soft in the middle. 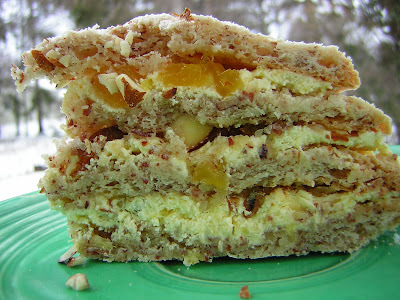 I would like to try them again, either with this or one of Alice Medrich's recipes, to try to get them really crispy all the way through (which is what I think of when I think tuiles). The cookies are a little fussy for my taste, but it was definitely interesting to try the new technique. 2. Using a hand whisk or a stand mixer fitted with the paddle on low speed, cream the butter, sugar and vanilla sugar to a paste. Keep stirring while you gradually add the egg whites. Continue to add the flour in small batches and stir to achieve a homogeneous and smooth batter/paste. Be careful to not overmix. 3. Cover the bowl with plastic wrap and chill in the fridge for at least 30 minutes to firm up. (This batter will keep in the fridge for up to a week; just take it out 30 minutes before you plan to use it). 4. Line a baking sheet with parchment paper and grease with either butter or oil spray. Chill the tray in the fridge for at least 15 minutes. Press the stencil on the baking sheet and use an offset spatula to spread the batter. Leave some room in between your shapes. 5. Bake in the preheated oven for about 5-10 minutes or until the edges turn golden brown. Immediately release from baking sheet with an offset spatula and proceed to shape/bend the cookies in the desired shape. These cookies have to be shaped when still warm. 1. Prepare everything in advance so that you will have the lemon juice and butter ready to add as soon as the pudding comes off the stove. 2. Whisk together the sugar and cornstarch in a medium saucepan (off the heat). Add a little bit of the milk and whisk until smooth. Add the rest of the milk and whisk to combine. Add the yolks, zest, and salt. Cook the mixture over medium heat, whisking constantly, until the mixture thickens and the whisk leaves a trail on the surface of the pudding. 3. Remove the pan from the heat. Pour in the lemon juice and butter and stir vigorously until the butter is completely dissolved. 4. Force through a strainer into a large serving bowl. This will filter out the lemon zest and any bits of cooked egg, leaving you with a perfectly silky pudding. Cover with plastic wrap, pressing the plastic wrap down to cover the surface of the pudding completely so that a skin cannot form. Let cool to room temperature. The refrigerate, covered, for at least 2 hours or up to 3 days. This was my first attempt at solo-sourdough, after receiving some starter from King Arthur Flour. The King Arthur folks also include very helpful instructions on getting your starter started, keeping it alive, and a couple of recipes. So far, I've made this basic sourdough recipe a few times with different variations, always with excellent results, so this is something you can play around with a bit. The first time I made the bread, I used the basic sourdough recipe, and added about 1 ounce of Humboldt Fog cheese to the dough at the end of kneading. I shaped the loaf by hand into a round shape. The bread had a wonderfully crispy crust and a soft crumb. It wasn't too sour, and had a very subtle cheese flavor--I would definitely add more next time (I was just using some leftover cheese so I didn't have very much). Although I know I'm not supposed to cut into just-baked bread, I wasn't able to resist with this one, and it was amazing warm out of the oven. Cutting into the loaf early didn't seem to hurt anything, and the rest of the loaf was quickly consumed! Feel free to double this as it made a relatively small loaf. The next time I baked the bread, I made two loaves and baked them in loaf pans. This worked well: the trade-off is that the crust was less crispy, but the loaf pan made the bread easier to cut into slices for sandwiches or toast. For the first loaf, I left the bread plain (without cheese), and the result was a mild, tasty sourdough that was a perfect pairing for my Mom's peach jam. For the second loaf, I added 1/2 ounce grated Parmesan cheese and 2 ounces grated sharp Cheddar cheese. 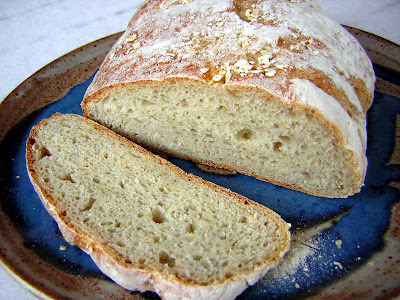 This loaf had a much cheesier result than the Humboldt Fog bread and was perfect for any and all savory uses. Don't forget to check out other awesome yeast-y goodies at YeastSpotting (round-up posted every Friday). 1. Combine all the ingredients except the cheese in the bowl of a stand mixer. Briefly mix to combine, and then knead to form a soft, smooth dough. Add more flour as needed; the dough should be only slightly sticky. 2. Crumble the cheese into small pieces. Flatten the dough into a circle or square on a cutting board or another flat surface. Sprinkle the cheese over the dough and roll up the dough. Knead briefly to distribute the cheese throughout the dough. 3. Place the dough in a greased bowl, cover, and let rise until doubled, about 90 minutes. 4. Shape the dough into a round loaf. Place on a lightly greased or parchment-lined baking sheet. Cover and let rise until very puffy, about 60 minutes. Slash the top, and bake in a preheated 425 degree oven for 25-30 minutes or until golden brown and hollow-sounding. Cool on a rack. My housemate even gave this bread an award! The plain loaf is on the left and the Cheddar-Parmesan loaf is on the right. Based on the ingredients in this salad at The Kitchn, I thought it would be tasty (of course, or else I wouldn't have made it!). But, upon taking a bite, I realized it was completely transcendent. I haven't involuntarily moaned over a non-dessert food in a while! It was seriously that good. 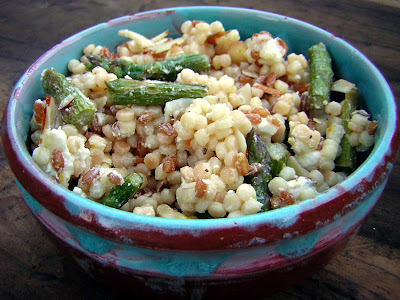 The asparagus was sweet and perfectly cooked; the grains and couscous were nutty and chewy, the goat cheese was creamy, and the Meyer lemon dressing gave everything a bright pop of flavor. Even though I was making something else for dinner (this was destined for packed lunches), I couldn't resist several spoonfuls! For lunch the next day, the salad was perfectly tasty but definitely not quite so irresistible. So, I would recommend making this just before eating, or perhaps packaging the dressing and cheese separately and tossing everything together just before eating. You can also experiment with other grains; the original recipe called for farro or spelt, which I think would have been delicious but weren't in my grocery's bulk bins. Definitely do go for the creamiest, yummiest goat cheese as that really makes a difference. 1. Set up your stove so that you have the wheat berries in one small pot, the simmering water or chicken stock in another, and the couscous in a saute pan. Cook the wheat berries as you would risotto, adding simmering liquid by the 1/2 cupful, waiting for each addition to be absorbed before adding the next. Meanwhile, toast the couscous in a dry saute pan until lightly browned. Then, cook it the same way as the wheat berries. When the couscous and wheat berries are nicely tender and they have absorbed the liquid, transfer them to a large bowl (the wheat berries will take longer to cook). 2. Trim the asparagus and cut into 1-inch pieces. Heat some olive oil in saute pan until shimmering and add the asparagus, along with a healthy grind of black pepper. Cook, shaking the pan occasionally, until nicely tender but not mushy. Add to the bowl with the grains. 3. To the grains and asparagus, add the almonds, goat cheese, and lemon zest. Toss to combine. 4. Whisk together the lemon juice and the olive oil in a small bowl. Drizzle over the salad and toss to combine. Season with salt and pepper. Don't forget to check out some other awesome pasta recipes from Erin of The Skinny Gourmet in this week's Presto Pasta Nights round-up, which will be posted this Friday. You can also find out more about Presto Pasta Nights here and check out the original host, Ruth, at Once Upon a Feast. These potatoes from Brownie Points are an all-time favorite of mine, although I've somehow never managed to post about them until now! They're tomato-y, saucy, and absolutely delicious. I think they're particularly good for breakfast or brunch (or breakfast-for-dinner), maybe with some sausages, eggs, and biscuits. Of course, they could also be tasty as a non-breakfast side dish. Now, I love breakfast potatoes, but somehow just never manage to make them at home. Grating potatoes seems like too much work, especially in the morning. And many recipes for home fries or even potato pancakes/hash browns require boiling the potatoes briefly before frying to make sure they get cooked all the way through, adding an extra step that just isn't going to happen before noon. That means I often cube the potatoes but skip the blanching step, resulting in home fries that are burned on the outside and raw on the inside: ick. Frozen hash browns from a bag aren't much of a solution; at least in my experience, they turn out incredibly mushy. These potatoes solve much of the home fries/hash browns problem, since the potatoes aren't cooked directly in the oil. 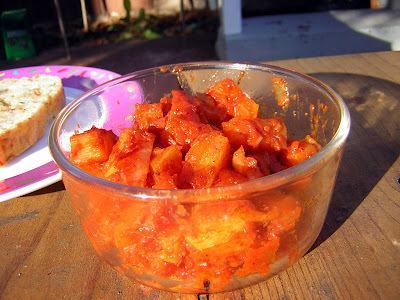 The potatoes simmer along with the tomato-pepper sauce, cooking fully as the sauce reduces and thickens. That means you can get them perfectly done to your taste. They may not have the crispy crust of a perfectly fried hash brown, but they're every bit as tasty in their own way and much more "foolproof." You can also change up the sauce ingredients to fit your own taste. 1. Fry up the bacon in a large skillet over medium heat. When it gets nice and crisp, scoop it out and reserve for another use (possibly just eating!). 2. Add the onion and salt to the bacon grease in the pan. Saute until soft. 3. Meanwhile, put the tomatoes, chicken stock, garlic and roasted pepper in a blender. Blend until smooth. 4. Once the onions are soft and slightly golden, add the potatoes to the skillet. Add the tomato mixture and the sugar. Stir to combine, cover, and simmer for five minutes. Then remove the lid and cook until the potatoes are tender, stirring occasionally. Add more chicken stock if you'd like the sauce to be more "saucy." 5. Serve with ground pepper, hot sauce, and/or thinly sliced scallions. I'm also entering this post into the February Potato Ho Down, where you can submit your own potato recipes now and check out lots of delicious entries starting on February 18. 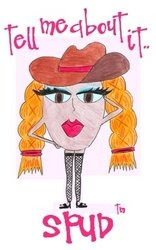 You can also check out past Potato Ho Downs on their blog. My mom invented this pancake recipe when I was home because we wanted to make some sourdough pancakes but didn't have a recipe. She also knows I love cornmeal pancakes, so we threw in some of that. We used homemade yogurt here, which is thinner than the type you would buy at the store. If you use store-bought yogurt, try to pick a thinner variety rather than a thick Greek yogurt and add milk at the end to thin the batter to a good pouring consistency. The pancakes have a great tang from the yogurt and the sourdough that is really delicious. We also used up some leftover pineapple syrup from this recipe, but I think you would also get good results by making some from scratch, with the recipe below. Maple syrup or another fruity sauce would also be tasty. Check out other awesome yeast-y goodies at YeastSpotting (round-up posted every Friday). Whisk the eggs, sugar, baking soda, oil, sourdough starter, and yogurt in a bowl until well mixed. Whisk in the flour, cornmeal, and salt, until just combined. Whisk in milk as needed to get your desired consistency. Scoop 1/4 cup-fulls of batter into a hot oiled skillet and cook until bubbles form and break on the surface. Flip, and continue cooking the other side. 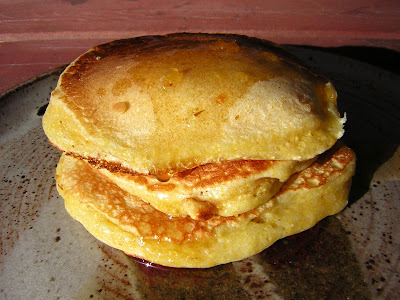 Enjoy with pineapple syrup or your favorite maple syrup. Combine the ingredients in a medium skillet. Cook over medium heat, whisking until the sugar dissolves. Bring to a simmer and cook, stirring occasionally, until the liquid is thick and syrupy. This is a really delicious vegetarian pasta dish that I've made a couple of times since purchasing Giada's Kitchen, an excellent new cookbook that was recommended by Cream Puffs in Venice with such delicious pictures and descriptions that I had to buy the book! I'm so glad I did as the recipes all sound amazing and everything I've tried so far has been absolutely delicious. With many recipes, even if I like and enjoy them, I know I'll probably only end up making them one time or very occasionally. With this particular recipe, though, I know it's a keeper I'll return to again and again any time I need a quick dinner, want to cook something relatively inexpensive, or am feeding vegetarians (and non-veggies!). You'll want to use a normal purple eggplant (not the small Japanese variety), but you can easily vary the amount by varying the eggplant size and amount of pasta. A smaller eggplant and 1/2 pound of pasta will make enough for two people, while a large eggplant and 1 pound of pasta will make enough for four. I've made it both ways, and didn't adjust any of the other ingredients...it turned out very well in either case. Check out some other awesome pasta recipes from Haalo of Cook Almost Anything, in this week's Presto Pasta Nights round-up, which will be posted this Friday. You can also find out more about Presto Pasta Nights here and check out the original host, Ruth, at Once Upon a Feast. 1. Preheat the oven to 400 degrees. Line a baking sheet with parchment or foil. In a large bowl, combine the eggplant, cherry tomatoes, garlic, olive oil, salt, pepper, and red pepper flakes. Spread the vegetables on the prepared baking sheet in an even layer. Roast in the oven until the vegetables are tender and the eggplant is golden, 35 minutes. 2. While the vegetables are roasting, lightly toast the pine nuts in a small dry skillet over medium heat until browned. Watch them very carefully, as they can burn quite easily. 3. Meanwhile, bring a large pot of salted water to a boil over high heat. Add the pasta and cook until tender but still firm to the bite, 8-10 minutes. Drain , reserving 1 1/2 cups of the pasta water. Return pasta to pot. 4. Transfer the roasted vegetables to food processor. Add the torn mint leaves and the olive oil. Pulse until the vegetables are pureed, but still somewhat chunky with some distinct bits of vegetables. Season to taste with more freshly ground black pepper. 5. Transfer the vegetables to the pot with the pasta and heat gently to make sure everything is warmed through. Add the pasta cooking liquid if needed to thin the sauce (I didn't need to do this). 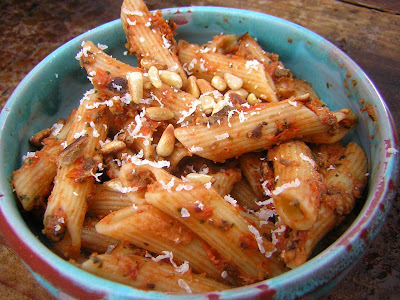 Serve with the toasted pine nuts and Parmesan sprinkled on top. I'm sending this off to the Pasta Blog Hop at Katherine Martinelli. 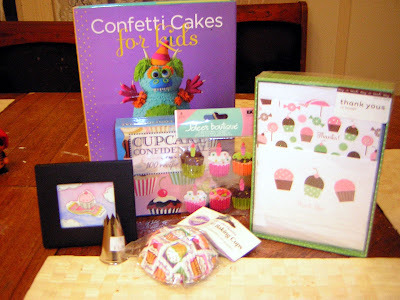 So many wonderful cupcake goodies! I put my winnings right to use with some espresso-peanut butter cupcakes. 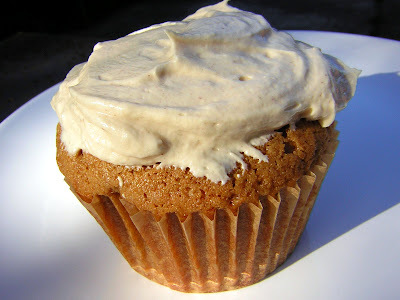 I loved the idea of espresso cupcakes, but the frosting was an American-style buttercream which I just wasn't in the mood for. Meanwhile, while I was glancing through my new copy of Confetti Cakes For Kids , I saw a Swiss meringue buttercream with peanut butter that looked simply divine. And it was--perfectly light and fluffy with amazing peanut butter flavor. I also used my new Beater Blade to mix the cupcakes, and it worked perfectly with the somewhat thick batter, mixing it thoroughly and scraping the sides really well. These were fabulous cupcakes. Although the combination of peanut butter and espresso sounds a little odd, it actually works really well. The somewhat thicker cupcake batter goes well with the light frosting, too. If you don't have self-rising flour, feel free to click through to the original recipe to get the amounts of leavening and salt; I just used it because I had some on hand and it worked well. I thought these cupcakes were best shortly after being frosted (within a few hours), but they'll keep for a few days in an airtight container. 1. Preheat the oven to 350 degrees. Place cupcake liners in two cupcake tins (for a total of 24 cupcakes). 2. Measure out the flour in a small bowl. Mix together the sour cream and espresso powder in another small bowl, stirring vigorously until the espresso powder is dissolved. 3. Cream together the butter and sugar in a large bowl until light and fluffy. Add the eggs and vanilla and beat until well combined. Add the flour and sour cream in alternating batches (flour-sour cream-flour-sour cream-flour), mixing after each addition until just incorporated. 4. Divide the batter among the cupcake tins. Bake 20-25 minutes or until a tester comes out clean. Let cool completely before frosting the cupcakes. 1. Whisk together the sugar and egg whites in the top part of a double boiler. Whisk continuously over a pan of simmering water until the mixture is hot to the touch, making sure not to let the eggs cook. 2. Quickly scoop the sugar-egg white mixture into the bowl of a stand mixer fitted with the whisk attachment. Beat on high speed until the mixture has cooled and formed a stiff meringue. 3. Stop the mixture and switch to the paddle attachment. Add the butter on medium-low speed, one cube at a time. Wait for each piece of butter to be incorporated before adding the next one. Turn up the mixer and mix until fluffy. Add a splash of vanilla. 4. Add the peanut butter and mix it in on low speed. Scrape the bowl and then whip at medium speed until smooth, light, and fluffy. If the consistency is too liquid, you can refrigerate it and then re-whip. This dessert may look like a challenge from the Daring Bakers, but actually it's one my mom and I decided to tackle all on our own! I would have to credit my past year as a member of the Daring Bakers in the success of this dessert, though, because without the techniques I learned through this group, I think the recipe would have been much too intimidating. I'm glad we did try it though, because believe me, this is so delicious. I would recommend making this with a friend because even with two of us, it has a lot of elements and was a lot of work. The final product was well worth it. 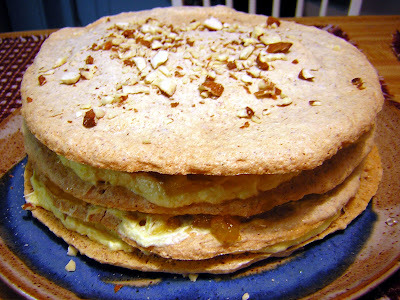 The finished pineapple dacquoise should be chilled at least briefly before eating it. If you eat it the same day it is made, the meringue will be somewhat more crunchy; if you save it until the next day, the meringue will be somewhat softer but we thought even more delicious. It is also easier to slice if it has been chilled at least overnight, although slicing still takes some patience (I never got it quite perfect!). 2. Preheat oven to 275 degrees. Line 2 rimmed baking sheets with parchment, and draw two 7-inch circles on each (for a total of 4 circles). Flip parchment over. Whisk whites, cream of tartar, and superfine sugar with a mixer on medium speed until combined. Gradually increase speed to high, and whisk until stiff peaks form, about 10 minutes. Add vanilla. Fold in flour mixture in 3 batches, adding each batch before previous batch is fully incorporated. Spoon batter into a pastry bag fitted with a 1/2-inch plain round tip. Starting in center of each circle, pipe a tight spiral to edges. Bake until dry and crisp but not browned, 45 to 50 minutes. Let cool on sheets. 3. Make the pineapple: Puree 1/2 cup fresh pineapple, and reserve for buttercream. Mix juice, granulated sugar, and salt in a large skillet over medium heat. Cook, whisking occasionally, until sugar dissolves. Add the remaining pineapple slices to skillet. Bring to a simmer, and cook until pineapple is light golden brown and liquid is syrupy, 1 hour or longer. (Add more pineapple juice if liquid evaporates too quickly.) Let cool in skillet. 8. Assemble the cake: Place 1 meringue layer on a platter. Gently brush layer with 2 tablespoons reserved caramelized pineapple syrup. Spread 1/3 cup chopped caramelized pineapple on top. Spread 3/4 cup buttercream on top, then sprinkle with chopped almonds. Repeat twice, then top with remaining meringue circle. Sprinkle with remaining chopped almonds. Refrigerate until buttercream is firm, about 1 hour. Cake will keep, covered and refrigerated, for a few days. For other terrific recipes from magazines, check out Magazine Mondays. My mom and I made this really yummy pizza for New Year's Eve--much yummier than our usual ordered-in pizza from East of Chicago or Pizza Hut, which is what we usually do for New Year's Eve! You can use your favorite pizza crust recipe (here are two I like, from Martha Stewart and Peter Reinhart), but you may want to go with a somewhat thicker crust since this has a lot of toppings. You can also use frozen or refrigerated pizza dough from a good grocery store, which is what we did. We used a somewhat spicy honey barbecue sauce, which was delicious, but anything slightly sweet would work. Just choose something that will go well with the pineapple. 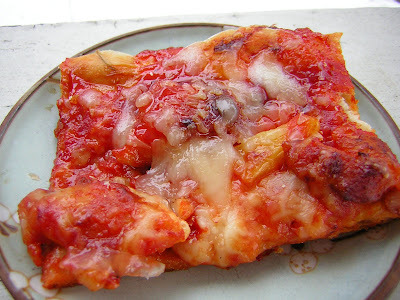 You can also omit the tomato sauce and brush the dough with olive oil instead, but I liked the tomato-y base. Be sure to use unseasoned tomato sauce (which usually comes in a can), because you don't want Italian seasonings competing with the barbecue flavors of the pizza. 1. Toss the chicken with 1/2 cup barbecue sauce and the black pepper in a large mixing bowl. Cover and refrigerate for at least 30 minutes. 2. 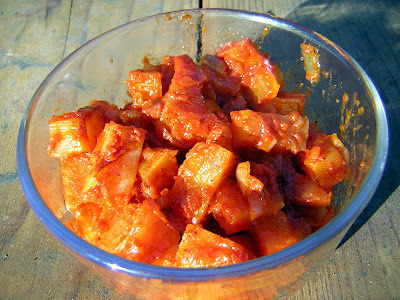 When the chicken is marinated, cook over medium heat until cooked through along with the barbecue sauce in the bowl. You can snip it into bite-sized pieces with kitchen shears before cooking it, or shred the chicken with two forks after it has been cooked. 3. Preheat the oven to 450 degrees or to the temperature required by your pizza dough recipe. 4. Stretch your pizza dough out to the desired size (we used two cookie sheets). Cover each crust with a very thin layer of tomato sauce. Add the chicken, pineapple, and red onion. Sprinkle the pizzas with the mozzarella and Gouda cheeses. 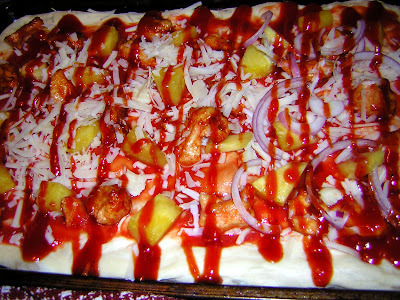 Drizzle the pizza with the remaining barbecue sauce. 5. Place the pizza in the oven and cook until the crust is nicely browned and the cheese is bubbling. If you tend to find that the tops of your pizzas burn before the crust is done, you can reserve a portion of the cheese and sprinkle it on halfway through baking. Here's the pizza all ready to go in the oven! 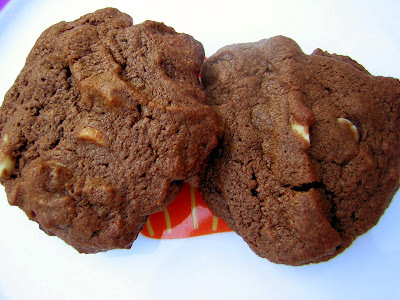 These cookies are really addictive with peanut butter and cocoa powder in the batter, and peanuts and chocolate chips as mix-ins (thus all the "double" in the title!). Take them out just after the tops set so that they'll stay soft and chewy. 2. In a bowl whisk together flour, cocoa powder, baking soda, and baking powder. In another bowl with an electric mixer cream butter, peanut butter, and both sugars until light and fluffy. Beat in eggs, 1 at a time, beating well after each addition. Beat in flour mixture and stir in chocolate chips and peanuts. 3. Drop dough by level tablespoons 2 inches apart onto buttered baking sheets and bake cookies in batches in middle of oven 10 minutes, or until the tops have just set. Cool cookies on racks. 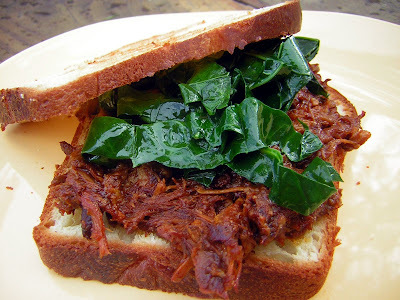 This pulled pork recipe is super easy--just brown the meat, mix up the sauce, and let the slow cooker do all the work. The flavors are incredible...just spicy enough and really delicious. The recipe is a combination of two pulled pork recipes from Rachel Rappaport's Coconut and Lime, also adapted to fit ingredients we had around the house. Rachel's recipe for slow cooker pulled pork looked delicious, but my housemate Jessie and I were also inspired by her recipe for East meets Southeast barbecued pulled pork, so we decided to combine them! The perfect accompaniment is Jessie's quick-cooking collard greens. Unlike most collard greens recipes that cook for a long time, these thin strips of collards get just a quick minute in the pan to wilt the leaves slightly while still leaving them green and delicious. 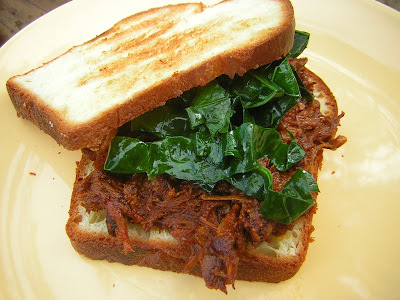 With some bacon for flavor, this dish is great either on the side or piled onto your sandwich. 1. Heat the olive oil in a large skillet. Season the meat with salt and pepper and brown on all sides. Transfer to crock pot. 2. Add the onions to the oil remaining in the pot and saute until soft. Transfer to the crock pot. 3. Whisk together the sauce ingredients and pour over the meat, turning meat as needed to make sure it is covered. 4. Cook on low heat for 8 hours, turning occasionally. Shred with two forks and serve on toasted rolls. 1. Stack several collard leaf halves and roll up tightly into a cigar shape. Cut crosswise into very thin slices (no wider than 1/4 inch). Roll and slice remaining leaves in same manner. 2. Cut bacon into small squares. Cook until crispy in a 12-inch skillet. Add collard greens and sauté, tossing with tongs, just until bright green, about 1 minute. Season with red pepper flakes, salt, and pepper. As my favorite recipe of 2009, I'm sending this off to Homemade - End of 2009 Edition. These orange scones are from an adorable set of cookbooks that my sister gave me for Christmas. The mini cookbooks are all arranged by ingredient, and this recipe, of course, comes from the orange book. These were so good, and I can't wait to try all the other recipes! The scones were delicious--not too rich or heavy, and a subtle orange flavor. 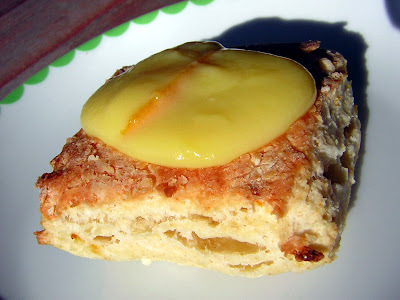 If you want more of an orange flavor in the scones themselves, you might add more orange zest or some orange extract. The orange cream is where the orange flavor really kicks in, so don't skip this part! 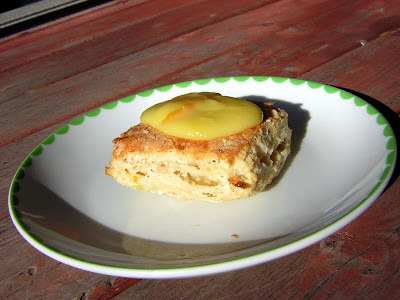 The orange cream is somewhat like a soft pudding, and is absolutely delectable, both from a spoon and on the scones. 1. Make the cream: In the top half of a double boiler, whisk together the orange juice, orange zest, lemon juice, eggs, and sugar. Add the butter and place the bowl over a pan of simmering water. Whisk slowly but continuously until the cream thickens, 10-15 minutes. Remove from heat and cool. 2. Make the scones: Preheat the oven to 425 degrees. Grease baking sheet or line with parchment paper. Mix together the flour, baking powder, sugar, salt, and zest in a large bowl. Add the butter and rub into the flour with your fingertips. Add the egg and milk, and mix together with a fork. Form dough into a ball, without kneading. It should be quite soft and pliable; add milk or flour as needed. 3. Pat the dough into a square or circle of about 1-inch thickness on a floured surface. Cut into squares or wedges and lay onto baking sheet. Bake 12-15 minutes, and then transfer to a wire rack to cool. I'm not really doing New Year's resolutions this year, but I do have a New Year's baking goal, which is to learn how to cook with natural leaven. I have always been intimidated by sourdough bread, but no more! My Uncle Jim has quickly been converting my family to sourdough, and I think I'm going to be next. :) He's passed along sourdough starter to my mom and my aunt, and I'm going to take some back to California with me or order some from King Arthur Flour if that doesn't work. In the meantime, my mom and I have been making some delicious sourdough creations with her starter. This is the first loaf we've tried, and it's absolutely amazing. A nice tang from the sourdough, but the combination of commercial yeast and sourdough starter plus sweet grated apples means that the bread isn't too sour. The apples also make the bread really moist and delicious. I got Peter Reinhart's The Bread Baker's Apprentice for Christmas from my dad, and his description of good bread fits perfectly with this one: cool and creamy. It's delicious topped with a little honey or toasted with peanut butter and jelly. The kneading instructions here aren't a mistake. 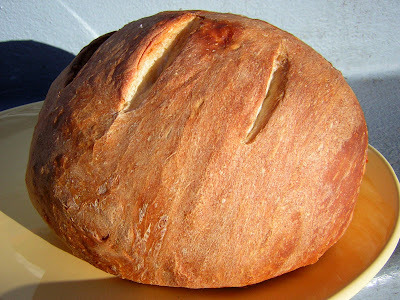 The cookbook author, Dan Lepard, advocates an almost no-knead approach. You knead the bread very briefly, let it rest, and repeat however many times required by the recipe. 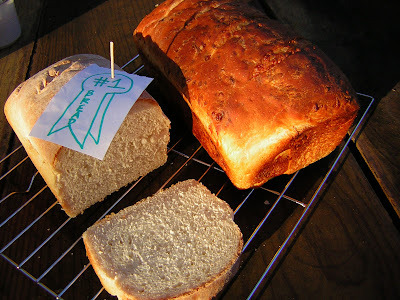 This is an easy approach to making bread and the result is fabulous! Check out Yeastspotting, one of my favorite blog features from the blog Wild Yeast, for lots of other yeasted breads (both natural and commercial). 1. Put the rolled oats into a small bowl and pour over the boiling water. Let sit for five minutes while preparing the other ingredients. 2. In a large bowl, combine the apple, water, leaven, and yeast. Stir the mixture well with a fork so that the yeast dissolves, then stir in the soaked oats. In another bowl, mix together the flour and salt. Pour the wet ingredients into the flour and stir the mixture together with your hads until it is evenly combined and you have a soft, sticky dough. Add more water or flour as needed. Scrape any dough from your fingers, cover, and leave for 10 minutes. 3. Rub 1 tsp corn or olive oil onto your work surface and knead the dough for about 10 seconds, ending with the dough in a smooth, round ball. Clean and dry the bowl, rub lightly with oil, and return the dough to the bowl. Cover and let sit an additional 1o minutes. 4. Remove the dough and knead briefly on the oiled surface, retuning to the bowl as a smooth, round ball. Cover and leave for 1 hour in a warm place. 5. Lightly flour the work surface and shape the dough into a baton or any other loaf shape you wish. Rub a dishtowel with a handful of flour and place the dough inside seam side up. Wrap the dough up snugly in the cloth, and allow to rise for 90 minutes, or until almost doubled in height. 6. Preheat the oven to 410 degrees. Upturn the loaf onto a flour- or semolina-dusted baking sheet and then dust the surface of the loaf with oats or fine oatmeal. Bake the loaf in the center of the oven for 30 minutes, then lower the heat to 375 degrees and bake for an additional 15-20 minutes, until the loaf is a good brown, feels light in weight, and sounds hollow when tapped. Allow to cool on a wire rack. This is a really tasty salad from the latest issue of Martha Stewart Living that's perfect for an slightly fancy lunch. It has a lot of parts, but with a couple of people working on it, it comes together fairly quickly. The original recipe called for sour oranges, which we didn't have; regular oranges still made a delicious salad. The original recipe also called for grilling the bread and shrimp, but since that's not exactly practical for the middle of winter, a big skillet works just fine. Even though this is from a January magazine, and even though all the ingredients are available in the winter, the recipe has a nice summery feel which can be really nice when it's cold outside! My only reservation with this recipe is the salad dressing. While it's definitely delicious, it doesn't taste anything like a typical Caesar salad dressing. 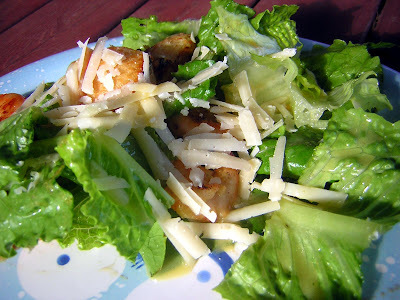 I'm not sure what exactly defines Caesar salad, but for me the dressing is a big part of it. I would recommend using your favorite store bought dressing here or another homemade version, perhaps with the addition of orange zest to bump up the orange flavor (this one, also from Martha, is very tasty). The orange-garlic dressing here would be delicious on mixed greens or pretty much any other salad that you're not calling a Caesar! 1. Mix shrimp and 2/3 cup marinade in a medium bowl. Cover and let stand, turning shrimp once, for 20 minutes. 2. Meanwhile, brush both sides of the baguette halves with Orange and Garlic Oil, and season with salt and pepper. Toast in a hot skillet until nicely browned. Let cool slightly and then cut into cubes. 3. Cook the shrimp over medium-high heat in a large skillet, working in batches as needed. Toss with remaining 1/3 cup marinade and let cool slightly. 4. Make the dressing: plunge whole egg in boiling water for 1 minute. Remove and let cool slightly in shell. Whisk together orange and garlic oil, orange juice, lemon juice, and Worcestershire in a large bowl. Whisk in egg. Season with salt and pepper. Taste, and adjust the seasoning as needed. 5. 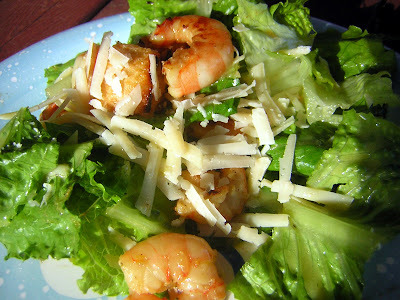 Toss dressing with romaine, avocado, croutons, and shrimp. Serve with Parmesan cheese. Whisk everything together in a bowl. Can be covered and chilled up to one day. Heat all ingredients in a small saucepan over low heat for 20 minutes. Let cool. Strain and discard solids, reserving 1 garlic clove for the Mojo Marinade. Can be covered and chilled up to one week. I'm sending this recipe off to Blogger Secret Ingredient: Parmesan!